On the cutting edge in design and style, the Direct Mount F-Series™ Fairings are available in different styles and heights. 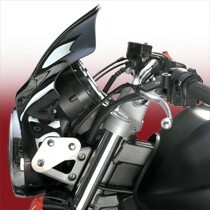 Direct Mount means the fairing mounts directly to the bike without any additional brackets, uprights or arm extensions. No other structural mounting brackets are needed! 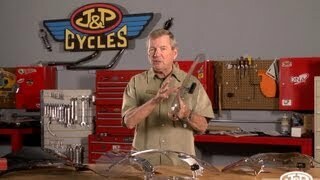 You get a clean, uncluttered look on the front end of your bike, and installation is a breeze. (1) BAG#459 (F-Series Adaptor Plates) is required for this application. (2) Lower lip of windshield will overhang headlight by 1/2 ". 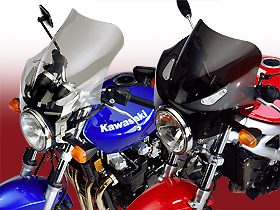 F-Series Fairings are "universal" applications that fit many bikes not listed here with side mount points and headlights up to 9.0" (228.6mm) in diameter. The stylish and unique F-Series™ F-18 borrows more than just a name from the double engine fighter. The complex, side to side, double bubble form of the F-18 Fairing is like nothing you've ever seen before. 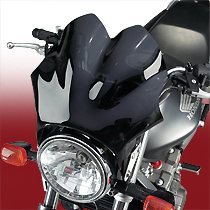 Enhance the look of your naked sport bike with this aggressive shield that looks fast even when standing still. With its tough, impact resistant, hardcoated polycarbonate, the F-18 is definitely a Top Gun! The F-Series™ F-16, a bit tamer in styling than it’s F-18 counterpart, is offered in two shield heights. 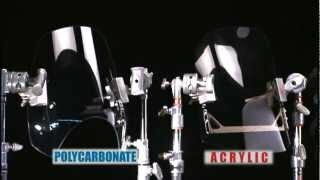 It is also made from Lexan® FMR hardcoated polycarbonate, which is 35X stronger than acrylic plastic. Choose the F-16 Tour (light tint only) for greater wind protection on those long sport-touring rides in the country. Or get the F-16 Sport (dark tint only) for a still-naked, aggressive look. The F-Series™ F-15 is the original F-Series Fairing. 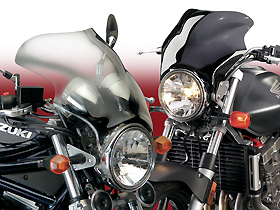 These larger windscreens, made from high impact acrylic, are not a "Direct Mount" hardware system, but mount to the motorcycle's headlight mount points with platinum colored aluminum uprights. The F-15 Tour (light tint only) offers excellent wind protection and makes a naked sport bike suitable for long tours. The F-15 Sport (dark tint only) is a medium-sized shield that offers good wind protection while maintaining your bike's sporty appearance. 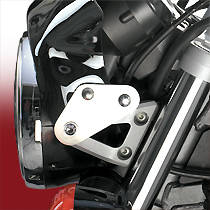 Direct Mount means the F-Series™ Fairings mount directly to the bike (typically the headlight brackets) without any additional brackets, uprights or arm extensions. No other structural mounting brackets are needed! All hardware included and packaged with windshield. Covered by our 3-Year Warranty against breakage!